More Swimmers through "Lessons from Lylah"
Each summer for the past few years, the American Chemistry Council has supported the National Swimming Pool Foundation’s Step Into Swim® program initiative known as “Angels of America’s Fallen” (AOAF). “Angels” provides healthy activities, including swimming lessons, for the children of our country’s fallen military and first responders. This summer, the Council has donated $5,000 to a new AOAF initiative known as “Lessons from Lylah.” The goal of the program is to create more young swimmers and in doing so, help prevent drownings. Lylah was the two-year-old daughter of Air Force Master Sergeant Josh Gavulic, who died during military training exercises in Arizona. Following their father’s death, Lylah and her five siblings were placed on an AOAF waiting list for healthy activities of their choice. Tragically, the toddler drowned in the family swimming pool before she could learn to swim. 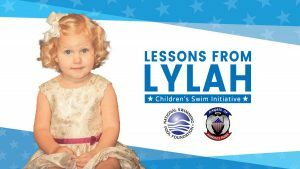 “Lessons from Lylah” was set up to offer every child of America’s fallen swimming lessons in Lylah’s honor. Not only is swimming a skill that can save lives, it can enhance the quality of life, paying dividends in good health and enjoyment. Knowing how to swim opens up a world of other water-related activities, including sailing, canoeing, fishing, and waterskiing. In supporting “Lessons from Lylah,” we honor the memory of Sergeant Gavulic and others who have lost their lives in the line of duty. Our group also remembers Dr. Jerod Loeb, who in addition to a career in healthcare administration, was a community first-responder in Buffalo Grove, Illinois. Jerod passed away in October 2013 after a courageous battle with cancer. Help support more children with swimming lessons by donating here.